The Voting Rights Act Is 50 Years Old Today. So Why Do Things Still Seem So Bad? It's fighting newly energized foes with worn-out tools and a missing Congress. WASHINGTON -- In the summer of 1962, 20-year-old Dorie Ladner accompanied a busload of black Mississippi residents to the county seat in Indianola, where the group of 18 tried to register to vote. It was a brave effort, if not something of a death wish. Back then in Mississippi, literacy tests and poll taxes were par for the course, as was intimidation and sometimes actual violence. That day in Indianola, white men with guns drove circles around the county courthouse. Ladner, who was an early member of the Student Nonviolent Coordinating Committee, recalled that the entire cohort was unable to register. "It was uneventful in that no one was beaten," she told The Huffington Post. Such blatant, systemic discrimination to stop African-Americans from voting now seems the stuff of history books. The credit goes to the Voting Rights Act of 1965, which was signed into law 50 years ago this Thursday. The VRA has been called "the most successful civil rights statute" in the nation's history and the "crown jewel" of the civil rights movement. But its victory is not permanent. Minority voting rights are again under attack in America, as the bipartisan congressional majorities that once backed the VRA have crumbled. In 1965, it wasn't certain that voting reform would pass. President Lyndon Johnson was hesitant to call for such a bill so soon after he had alienated fellow Southern Democrats with his push for the Civil Rights Act of 1964. His hand was forced, however, on March 7, 1965, when civil rights marchers leaving Selma, Alabama, for the capitol in Montgomery were attacked by state troopers with nightsticks and tear gas at the Edmund Pettus Bridge on "Bloody Sunday." Ladner, who was in Selma at the time, did not march because she thought walking across the bridge was "suicidal." Her fear proved prescient, as her fellow SNCC leader John Lewis, now a Democratic congressman from Georgia, was nearly beaten to death. But within days of "Bloody Sunday," Johnson directed the U.S. Department of Justice to draft a bill that would protect the rights of minority voters across the country. He gave a game-changing speech urging Congress to pass the legislation swiftly and calling the right to vote "the most powerful instrument ever devised by man for breaking down injustice." The Voting Rights Act was approved with bipartisan support; Johnson signed it into law on Aug. 6, 1965. Recognizing that many states wouldn't welcome new voters with open arms, Johnson ordered federal workers deployed to especially hostile counties in Southern states to register voters. That effort, along with the law's limitations on the use of voter literacy tests, saw immediate results: In those states judged to have the most egregiously discriminatory voting regimes, black voter registration rose from 29.3 percent in 1965 to just over 52 percent in 1967. 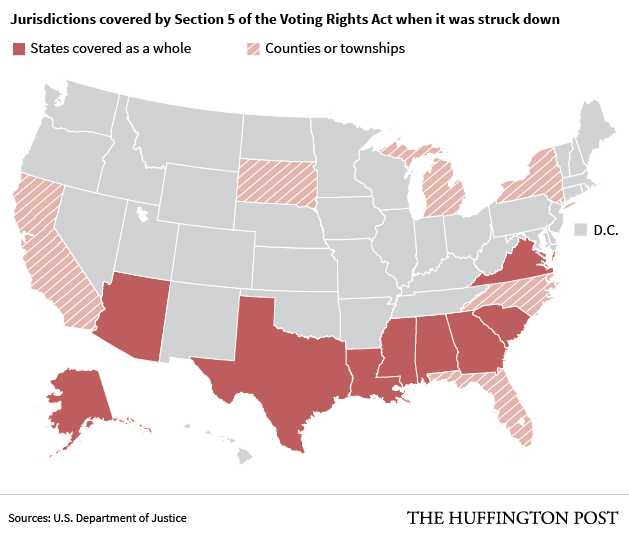 In the longer run, the Voting Rights Act's most effective weapon in protecting minority voters was its Section 5. Before the VRA, voting rights enforcement depended on often reluctant judges and elected officials who simply created new methods of exclusion when their old ones were banned. Section 5 required those states and counties with particularly egregious histories of discrimination to clear any changes to their election procedures with federal officials or in federal court before implementing them. The reach of this pre-clearance section became evident when the Supreme Court in 1969 ruled against election law changes in Mississippi and Virginia. In an 8-1 ruling, the court said that private individuals can bring cases under Section 5 and that it covered "the subtle, as well as the obvious" state acts that deny people the right to vote based on race. Violations of the VRA continued to be found in the 1980s, 1990s and 2000s. In 2006, the Voting Rights Act was reauthorized for 25 years, over the objections of some conservatives who complained that Section 5 was an assault on states' rights and who opposed the expansion of ballot accessibility for non-English speakers. Despite those critics, the reauthorization had bipartisan support in Congress. And then Section 5 was torn out of the act. In 2013, the Supreme Court struck down Section 5 because, as Chief Justice John Roberts wrote in the majority opinion, "things have changed in the South." Justice Ruth Bader Ginsburg found that rationale infuriating. In her dissent, she argued that the conservative justices were stripping from the Voting Rights Act the very mechanism that had made it such a success. "Throwing out preclearance when it has worked and is continuing to work to stop discriminatory changes," she wrote, "is like throwing away your umbrella in a rainstorm because you are not getting wet." The immediate question was how effective the act's remaining sections could be in protecting gains made over the last five decades. Since Republicans captured a swath of state legislatures in 2010, civil rights groups have been fighting a flood of new voting restrictions that were enacted for the ostensible purpose of preventing almost non-existent voter fraud. The advocates have turned to Section 2, which bars election procedures that discriminate on the basis of race, to combat these strict new voter identification laws, cutbacks to early voting and elimination of same-day registration. Their efforts received a boost on Wednesday when a federal appeals court found that Texas' voter ID law violates Section 2. A federal judge had earlier found that the law effectively served as a poll tax (because of the cost of obtaining the necessary documents for a valid ID) and was intentionally discriminatory. Over 600,000 Texans were estimated to lack a valid form of government-issued photo ID, with black and Latino voters much more likely to be without such an ID. But the Supreme Court had still allowed the measure to remain in place for the 2014 midterm election. Despite this week's victory, the problem remains that Section 2 offers more limited protection than Section 5, since it puts the burden on the plaintiffs to bring suit to show discriminatory effects after a law has passed. "Instead of the Section 5 world, where the state would have to show that laws are not discriminatory before they implement them, now we have a situation where plaintiffs need to show that laws are discriminatory and are sprinting to do that before people’s rights are violated in an election," said Julie Ebenstein, a staff attorney with the American Civil Liberties Union's Voting Rights Project. Sections 2 and 5 also differ substantively in how they judge whether a law restricts minority voting rights. Section 5 compared what the position of African-Americans would be under a proposed change of election procedure with their current position, while Section 2 considers whether an election law would, in effect, disproportionately affect minority voters compared to white voters. "Obviously the VRA still plays a huge role in protecting voters, but it remains to be seen how the Voting Rights Act will protect against second-generation barriers," Ebenstein said. "There’s no longer literacy tests, property requirements, but when you look at the information that we have today -- who votes during early voting, how you can remove the exact days African-Americans vote, or who uses same-day registration, and how you can attempt to remove certain voters from the electorate -- these are still very high hurdles and strong barriers against people casting a ballot, and they should be taken just as seriously as prior forms of discrimination." A coalition of civil rights groups, including the ACLU, is now challenging a package of voting restrictions that North Carolina rushed to pass after the Supreme Court invalidated Section 5. The plaintiffs are asking a federal judge to reinstitute the pre-clearance regime for North Carolina under Section 3 of the VRA. Section 3 allows a court to require pre-clearance of a state's election law changes once it has found that the state intentionally discriminated in a current case. In this case, the plaintiffs argue that the lawmakers knew that African-American voters were disproportionately likely to vote early, vote out of precinct and use same-day registration. But victory is not assured. The North Carolina plaintiffs don't have the sort of damning emails or incriminating statements that have surfaced in other places -- like Texas, where lawmakers discussed how to craft a district with a large Hispanic population but low proportion of eligible Hispanic voters or, as they called it, an "Optimal Hispanic Republican District." Fights over voting rights are a useful metric by which to measure how polarized the two major political parties in America have become. When the Supreme Court limited what kind of discrimination was banned under the VRA in 1980, Congress responded in 1982 in a bipartisan fashion to broaden Section 2. President Ronald Reagan signed the legislation. Now, bills to restore the VRA can't even get a hearing in committee. Republicans argue that the Voting Right Act deserves to be celebrated but that it has served its purpose, while Democrats say that discrimination is still rampant. With the two parties farther apart than ever on the issue, the VRA has fallen between the cracks. This new reality is frustrating for Clarence Magee, who serves as president of his Mississippi county's NAACP chapter. Magee and his wife, Carrie, were witnesses in a federal trial over denied voter registrations in the early '60s. He finally received his registration card in 1963 or 1964, he said, after failing to get on the rolls at least five times. "When I showed up, they would say the registrar’s not in -- or if you saw the clerk, they would say, ‘What you want, boy, who sent you?’" he told HuffPost. "While it was embarrassing, it only increased our effort to get it." At the trial, Magee said, it was pointed out that an illiterate white truck driver had been registered to vote after he marked an X above the signature line. Today, Magee looks around and sees an increasing number of states throwing up legal restrictions to once again impede the ability of people of color to vote. "We thought the Voting Rights Act was permanent -- it had been reauthorized over and over -- so never in our imagination did we think Section 5 would be stripped away and made ineffective," he said. "The roadblocks are still out there."